This is nothing short of amazing. In the last update, 2ine was running simple 32bit programs on Linux, and providing a portable API set to allow strict OS/2 API based programs to run on Linux. As you can read right now It’s running a simple OpenWatcom 16bit hello world based program. The 16bit OS/2 and 32bit OS/2 API’s ended up having different calling sizes, among other issues which had complicated the bridge program. However Ryan’s newer use of scripts to generate the required glue for the API’s at least mean that adding the 16bit/32bit calling conventions & required bridges/glue is at least now automated. This is super cool, as this will eventually open the door to Watcom C/Fortran, Zortec C, Microsoft Basic/C/Cobol/Fortran and of course many other languages that burst out into the initial OS/2 scene before the eventual weight of the SDK & associated costs doomed OS/2 to failure. Author neozeedPosted on June 11, 2018 Categories 80286, 80386, i386, OS/2, OS/2 1.3, OS/2 2.0, syscall emulation14 Comments on 2ine updated to have preliminary 16-bit .exe support! 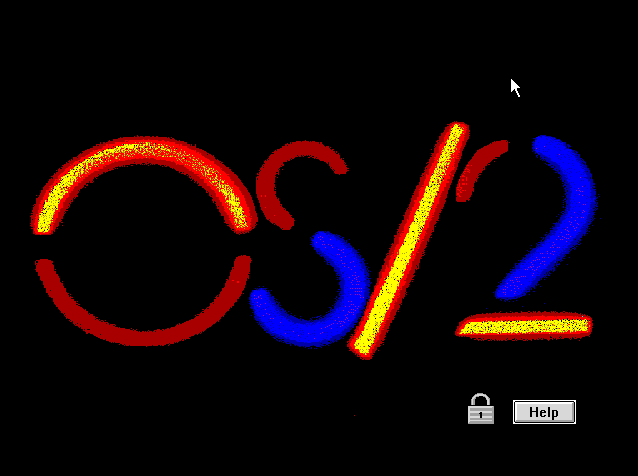 Over at pcjs.org, this interesting prototype version of OS/2 has been unearthed. What this means is that not only was there prototypes of a 386 aware version of OS/2 in 1986, but by 1987 the base of cruiser AKA OS/2 2.0 was already in place. With this now somewhat made public, it really is clear that IBM’s meddling in OS/2 prevented it from being a success. The following text is from an email titled “3xBox Design Document” sent to the football alias on Saturday, February 28, 1987, at 5:02pm. 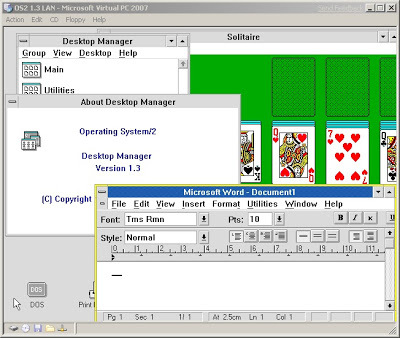 The goal for this research project was to demonstrate the feasability of supporting multiple virtual DOS 3.x machines on a 286DOS-based kernel running on an 386 personal computer. Each “3xBox” would have its own virtual screen, keyboard, interrupt vectors, and address space. Furthermore, well- behaved DOS 3.x applications that do text (as opposed to graphic) screen output would run in the background. In order to acheive this goal in a reasonable amount of time, we started from the 286DOS “sizzle” kernel and made the minimum amount of changes necessary, both in code and fundamental design. The resulting DOS will be referred to as “386DOS” in this paper. 386DOS provides up to four 3xBoxes, depending upon the available RAM. More 3xBoxes could be supported if a slight change is made to the method of allocating page tables. Well-behaved DOS 3.x applications (i.e., MS-Multiplan, MS-Word, Lotus 1-2-3) can run in the background, multi-tasking against one another and against the foreground screen group. Lotus 1-2-3 (version 2.01) passes its floppy-based copy protection when in the foreground. It should be noted that 386DOS, while functional, is not an optimal design/implementation of multiple 3xBoxes. 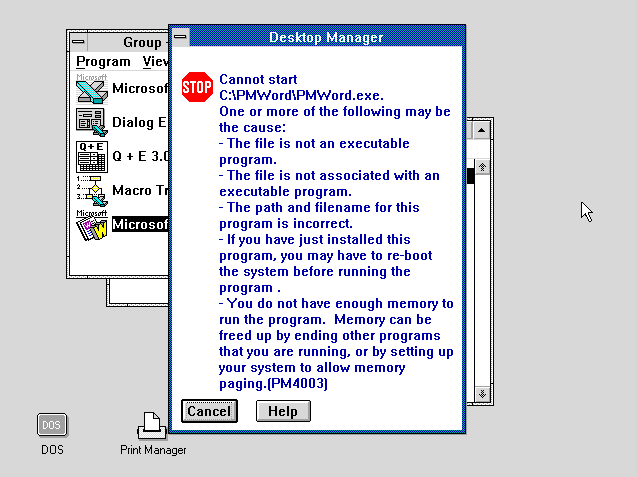 In particular, interrupt management, the device driver model, and the existence of V86-mode kernel code should be modified before 386DOS is made a commercial product. This is either the selector:offset or segment:offset address used by unprivledged machine language code. used by PhysToVirt to map “high” memory in “REAL” mode. 1) When a PMBox is running, the TSS Ring 0 Stack is a PTDA TCB stack. + This is consistent with the 286DOS model. 2) When a 3xBox is running, the TSS Ring 0 Stack is the “V86 Stack”. + The V86 Stack is allocated in the 3xBox PTDA. + GP-Fault handler reflects to 3xBox IVT handler in V86 mode. o Look up handler in 3xBox IVT. o Edit TSS Ring 0 Stack EIP and CS to point to IVT handler. + IVT interrupt handler IRET uses IRET frame we built on old stack. + Remain on V86 stack, process exception, and IRETD. + Build V86 IRETD frame on current stack and IRETD. This disk contained an updated version of OS/2 FOOTBALL Boot Disk (v4.41.00). It was built in December 1987, using final OS/2 1.0 sources merged with assorted FOOTBALL changes, and although it was originally assigned version number 1.3, this version of OS/2 would ultimately become 2.0. The numbering of revisions must have been, um, revised, because despite the lower revision (4.41.00 vs. 7.68.17), it is newer than the 7.68.17 prototype. This is confirmed by the boot message (12/02/87), the file dates (12-23-87) and the higher version number (1.3). 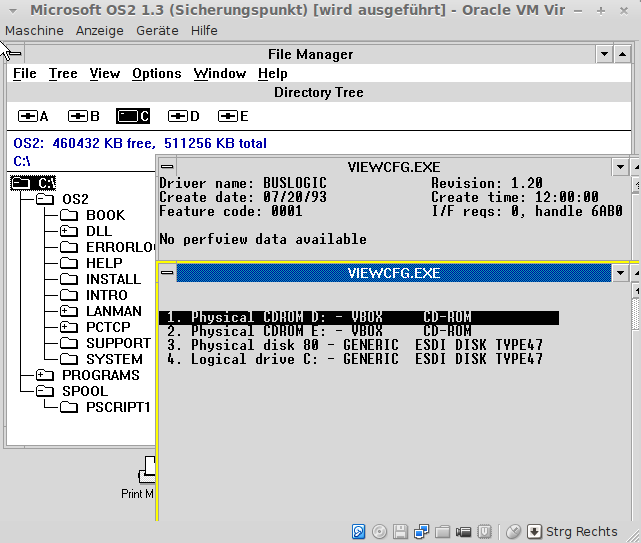 I was passed this in email, that using the BusLogic SCSI adapter, that OS/2 1.3 can use it’s CD-ROM interface for those of you who want to be able to directly mount ISO images! So apparently all you need to do is just add in the BusLogic controller, and copy the BOOTBID.BID to C:\ (don’t rename it). Apparently, it can even boot from SCSI hard disks. So it’d be a great way to give that SQL 1.0 install access to a bunch of storage. Tobias let me know that he’s released his IDLEHLT16 driver for these early OS/2 versions. If anyone has run them in an emulator, you’ll know they’ll easily soak up 100% of the CPU they are given. This process will call the HLT opcode found in later (well compared to the 80286!) processors allowing them to ‘sleep’. Needless to say, for fans of the beleaguered 16-bit OS, this is a great thing to have! If anyone wants to know why there isn’t one for OS/2 2.0 and above, it doesn’t need one, it can sleep fine on it’s own. At first I tried version 2.0 and it just reboots once it is going to start the installer, (I haven’t tried a pre-installed disk image yet) but for the heck of it I shoved in an OS/2 1.1 boot diskette, and it came up! So all excited I tried 1.21 and it worked as well! 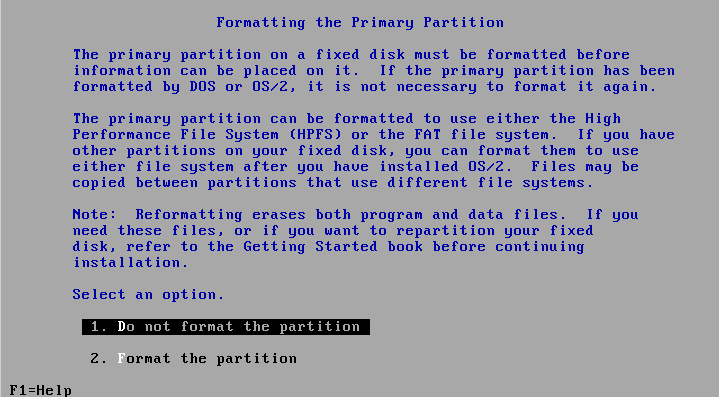 The caveat is that OS/2 cannot partition or format the disk. I didn’t try giving it a HPFS volume, but rather setup for a DualBoot with MS-DOS, and that worked fine. Some of the cool things about PCem is that it runs REAL firmware, so you get the real XT/286/386/486 experience. Also it is cycle accurate so things are SLOW like they were back in the day. I’ve noticed that disk IO is really slow. Again just like it was back then. Things like DOOM take forever to load on a 386. Just like the real thing! If you have the ROMs the CGA/EGA & SVGA emulation is pretty good. Again this is largely from running the actual firmware. Work has slowed on PCem, but there is a source repo here. I haven’t tried to build it yet. The only thing I’d say is missing is some kind of ethernet adapter. It would be cool to get this onto the internet. But at the same time I’ve got to say this is pretty cool, especially if you want to enjoy the PC experience from 20 years ago, this is the way to go! Although after a few minutes of running a 286 at 6Mhz, you’ll want to push for the fastest 486 it can emulate! 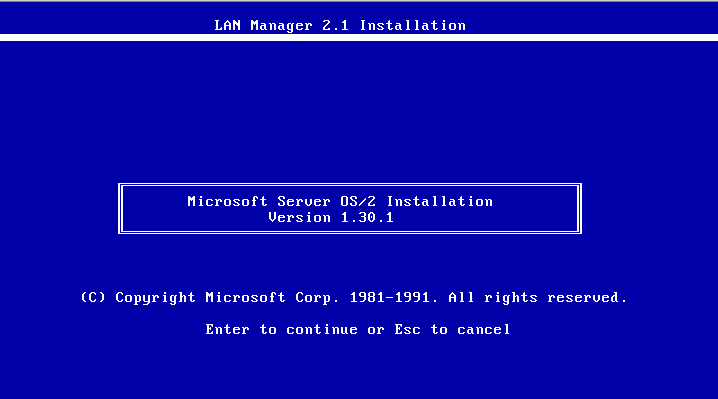 Keeping with the ping-point tradition, I’m going to upgrade IBM OS/2 1.2 to Microsoft OS/2 1.30.1, the LAN Manager 2.1 install. 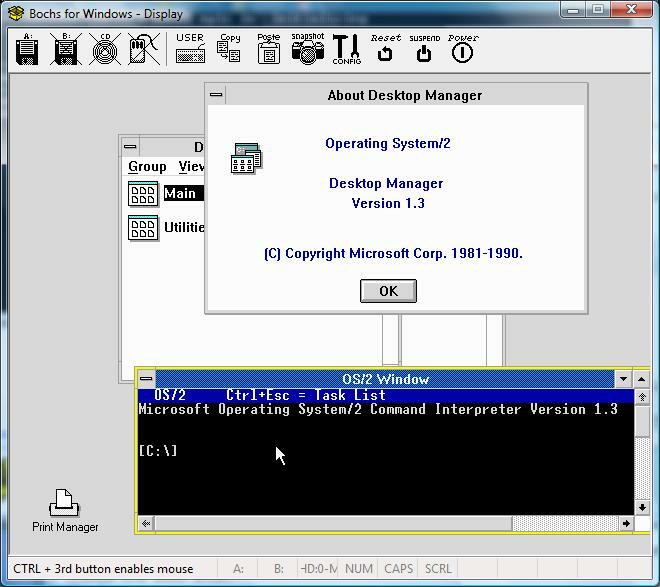 At this point Microsoft basically was taking IBM OS/2 1.3 and repackaging it. All their efforts were shifting out of OS/2 and into Windows NT. 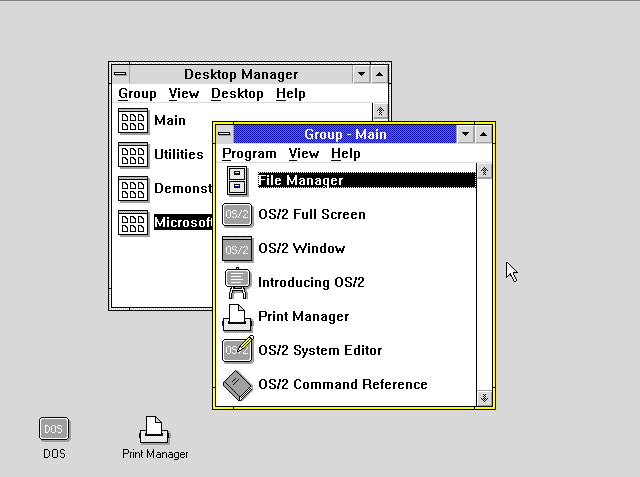 But to support existing customers and build their enterprise market OS/2 was still very much an integral part of the strategy as Windows NT wasn’t ready by a long shot yet. Products like Microsoft Mail & SQL Server (ported & rebranded Sybase SQL) were the companies future direction, but for now they were OS/2 applications, and they needed an update from OS/2 1.2. And continuing on, it’s the same bland tradition. Maybe I just have mixed feelings about the grey background thing, it just feels either military or industrial. 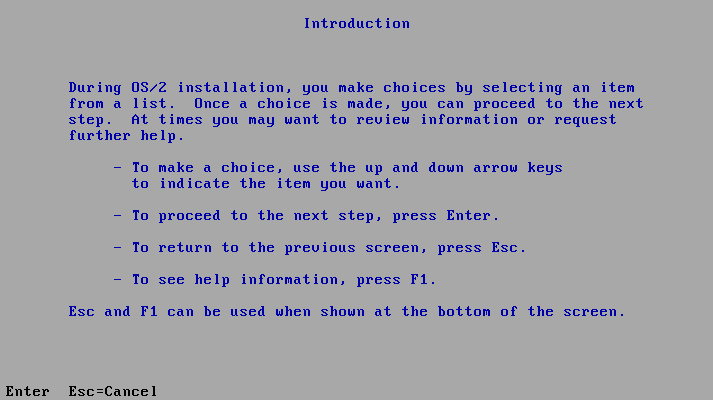 Then again that was what OS/2 was trying to be, industrial computing on the PC. I suspect there was a color study done by IBM on the whole look and feel. The schema feels like a design by committee thing. And please, don’t format my disk! It sounds like a lot more stuff… But go through and select down the line. It is strange that my control+c (break) on is never honored, I have to always go there and enable it. Now we just shuffle diskettes, and let the install finish up. 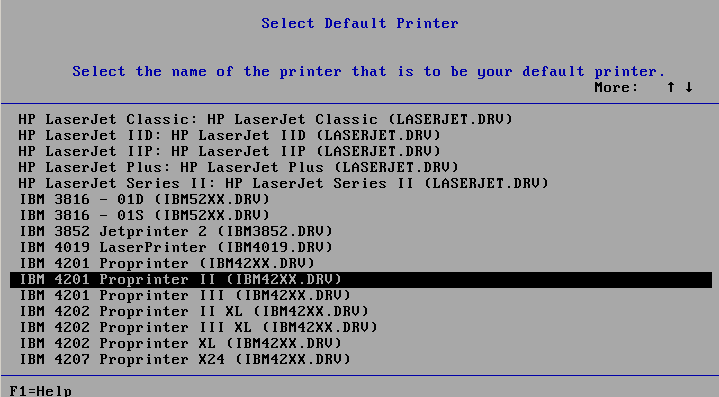 And to select a printer. I don’t know why it just doesn’t upgrade my old printer, maybe it just wants to show off all the drivers… A sharp contrast from OS/2 1.0! So with the install done, and a quick reboot we are teleported to the OS/2 1.3 desktop. Very cool. And… very.. 1.2’ish. So I thought I’d first verify my applications work. Excel launches but Word..
Ouch. I guess this Microsoft OS/2 doesn’t do upgrades. Although it did preserve my groups. I’ve got to say this is kinda sad. At least it did backup the config.sys so I could simply append the lines to the PATH & LIBPATH and get my applications running again. One can’t help but wonder if this was some passive aggressive attack on Word & Excel? 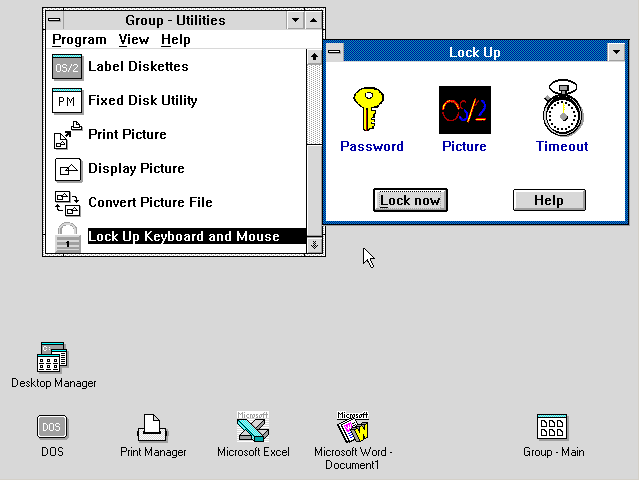 Also new in OS/2 1.3 is the ability to lock the desktop!  Good stuff to keep people out, too bad it’s just a system thing, not an account / role based thing. The default ‘screen saver’ lockout screen is the OS/2 logo. I’ve only seen it on the Microsoft BOX, and a few Microsoft books, but here it is. OS/2 1.3 is said to be more stable then OS/2 1.2, and faster. I couldn’t tell the difference, I’m sure being under emulation would be one of the reasons, the other being on a significantly faster machine. Nobody could imagine Ghz CPUs in 1987. I don’t have much to add to OS/2 1.3 as it really feels like OS/2 1.2. 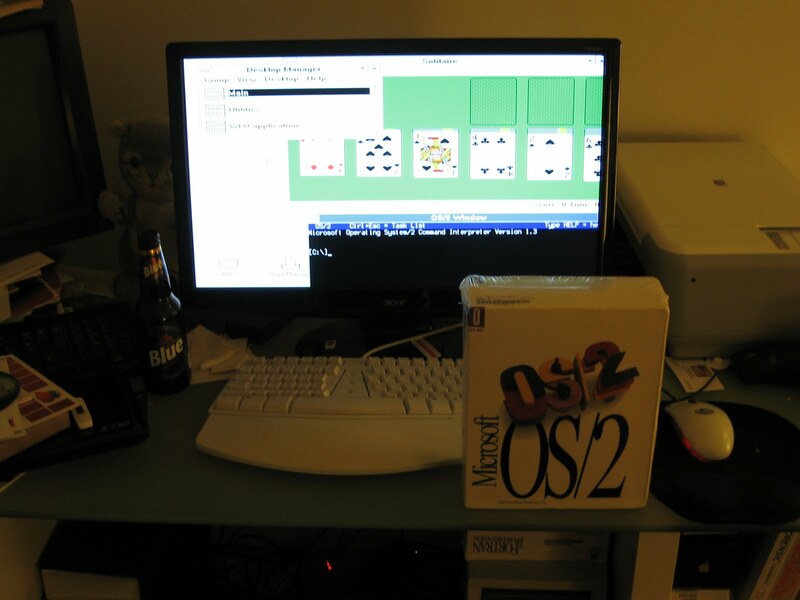 Next up is OS/2 2.0, the first of the 32bit releases of OS/2… Operate at a higher level! Well one thing is for sure, QuickC for Windows, wins HANDS DOWN for a ‘nice’ environment for building stuff… Once it was all said & done, on Windows 2000, I had f2c running, and converted the dungeon source, and building dungeon along with the libf2c. I couldn’t find a ‘nice’ way to build libraries with QuickC, and building a windows dll for libf2c would mean re-writing the IO for Win16.. If it were 15 years ago I may have done so, but nobody will use it now, so I just took the short cut of compiling the dungeon program & the library together… Surprisingly on a ‘fast’ machine with Virtual PC, 100,000+ lines of code compiles in under 10 seconds! Which wasn’t that bad, and I’m just amazed it works… You can download it from here. And thanks to the power of jDOSBox, you can run it live here. The next thing I did was break out some ancient Microsoft C, and start to build f2c. That is when I found out that the resulting exe with C 5.1 doesn’t work, and 6.0a crashes when compiling part of the translator… However using 6.0a for *MOST* of f2c, and building the one faulting module with 5.1 results in a working f2c. The library built without issues, although I had a *HELL* of a time trying to remember how to build a static library for OS/2. I ended up just using lib & gluing it together one object file at a time… Not the ‘best’ but it works. The next hardest thing was figuring out the linker definitions & response files to build a ‘windowed’ text client for OS/2. Luckily I was able to go through enough things to do it, and it was a LOT of work…. 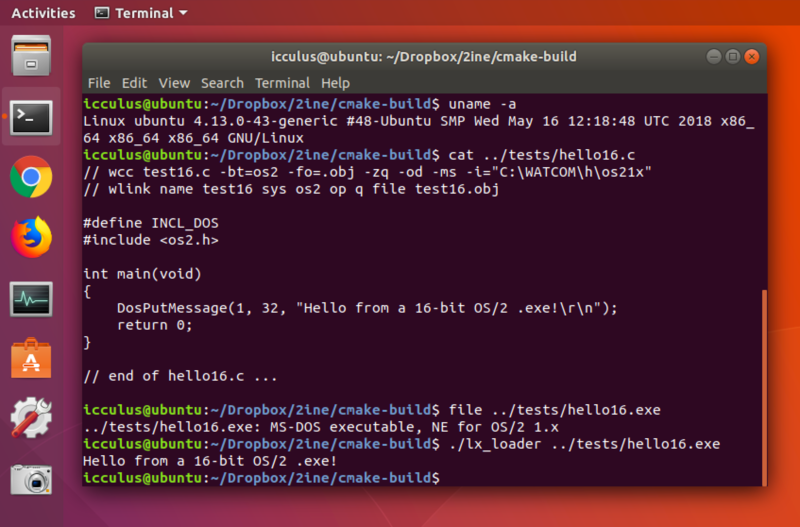 I almost wonder if it’s worth posting about it… But all my build steps are in the zip file located here. Dungeon on OS/2 in a window via special linking.. It was a *LOT* of nonsense work to get this thing in a window for a good screencap… lol but in the end I guess it was worth it. I suppose I could try building it for MS-DOS, but really, where is the fun in that? 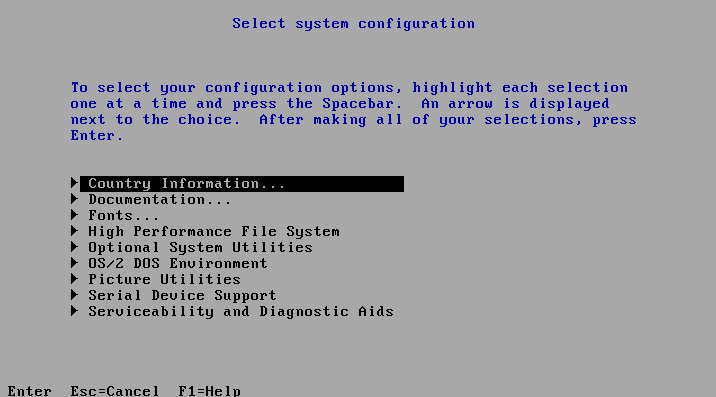 One thing is for sure, having this back when I actually used OS/2 1.3 or Windows 3.0 (I had CGA!!!) would have been cool… But now I guess it’s totally pointless, but whatever. 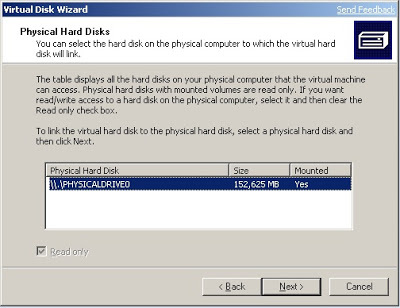 In Virtual PC you can create a ‘virtual disk’ that links to a physical volume..
And again, just select a physical slave disk with your legacy OS already installed. Once the disk is linked, re-run the utility and you can then convert the linked disk into a dynamic disk. 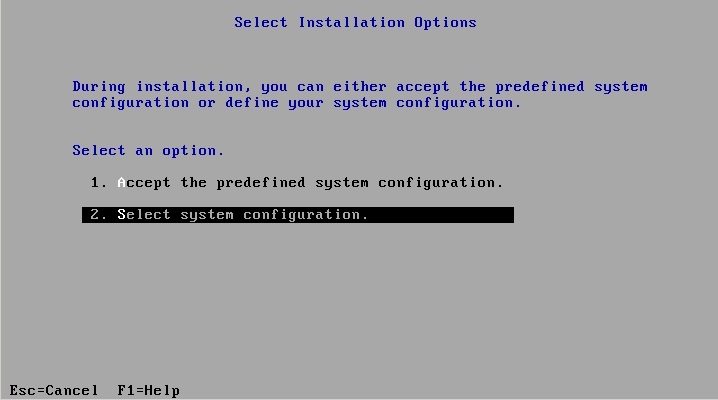 Once you have your .vhd, you can use Qemu’s qemu-img tool to convert the disk image into qcow,qcow2 (Qemu) or even VMDK for VMWare. The syntax is pretty simple..
I’ve tested it with AT&T SYSVr4 & OS/2 1.3! 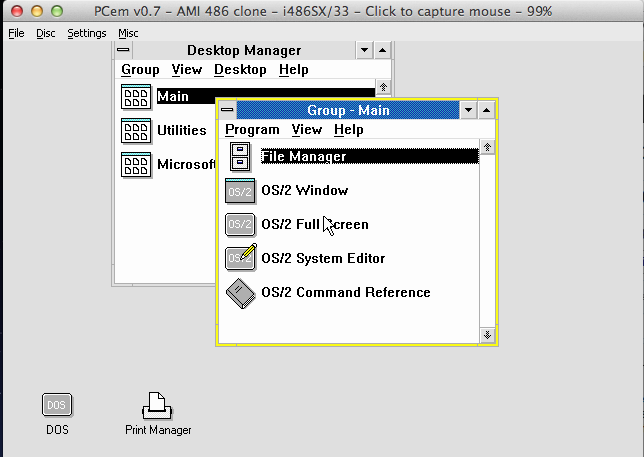 Much to my amazement with the fixpacks, OS/2 1.3 will actually RUN on Virtual PC 2007. It’s a shame that IBM saw the SDK’s for OS/2 as a revenue generation opportunity, as it’s amazing how quick it is (once it’s done initializing….) but I guess that’s a given of any 16bit OS that’s written in assembly…. For the heck of it, here’s a screenshot. OS/2 1.3 does infact run under BOCHS. Here is the catch, like Xenix you currently must make an image of an existing installation, and point Bochs towards it. Bochs will complain about the geometry not matching… Just hit the ignore button, and it boots up just fine. Thanks to Geoff Shearer for trying, since I had figured it wouldn’t even work. I promise, a quick tour of SLS Linux next time… Where the distro wars all started! Author neozeedPosted on May 30, 2007 August 24, 2016 Categories bochs, OS/2 1.3Leave a comment on A minor update….